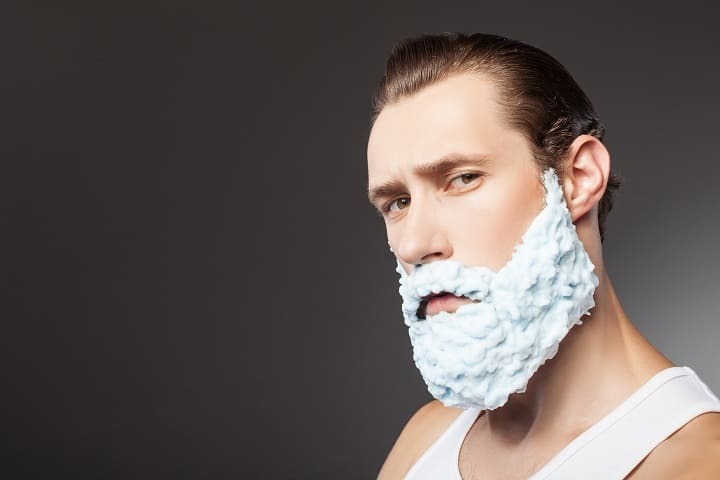 When it comes to men’s products, shaving soap has been around for just about as long as the concept of shaving itself. These days, canned shaving cream has mostly taken its place on convenience store shelves. However, those who value tradition, quality and luxury still suds up with a quality puck when it’s time to trim their whiskers. Though it requires a bit more time and effort, these products are perfect for men who value class, grandeur, and the timelessness of quality shave. Unlike shaving cream or gel, shaving soap comes in a hard puck. It takes a little bit of skill and preparation to use and has thus become less popular than other, instant shaving alternatives. Sure, they take a little bit more time to prepare for use than quick and easy foam methods, but Rome wasn’t built in a day; a quality shave is well worth the time it takes for a soap puck to soak and soften. Shaving soap’s delicate consistency allows for a bit more precision than products like canned shaving cream. By providing additional cushion and slickness, it allows the blade to sever hairs closer to the skin without leaving behind pesky nicks or cuts. This allows for an overall closer shave without any danger of infection or razor burn. Speaking generally, shaving soap usually has higher-quality ingredients that allow for heightened performance. Because products like shaving cream must include additional preservatives and accelerants in order to permit canned storage, their overall quality is inevitably lesser. Shaving soaps, on the other hand, generally have straightforward, natural ingredients list. For those who are truly invested in the quality of their shave, there’s no better option. Because the best shaving soaps can be used with any type of razor from safety razors to straight razor and shavettes, it’s noted for its versatility. It also improves the shaving experience of men with all hair types from thick to thin and everything in between (except maybe of course a back shaver). If this is your first go-round with the purchase of a high-quality shaving soap, your head might be spinning at labels that drop terms like “triple-milled,” or “croap”. Before you run out and sink your money into a shaving soap, you’ll want to learn a little of the lingo. Most of the shaving soaps on the market are triple-milled. This means they’ve been grated and processed in order to be a bit more user-friendly. Their only downfall is that they do tend to be costlier than their semi-hard or croap competitors. However, their harder pucks mean they last longer and (in some cases) are well worth the higher price. If you’re here, it probably means you value the shaving experience. No wet shave is a cheap shave. If you want to feel like you’ve just gotten out of one of those classic chairs for the barber shop in some old-school professional’s store, then you’re after quality. When it comes to quality, cost makes all the difference. Semi-hard soap products fall somewhere in the middle of the line between hard triple-milled products and softer croaps. Their goal is to serve as the perfect compromise between triple-milled and croaps: they have most of the benefits of the former, with the softness of the former. However, because they haven’t been grated and re-processed like their triple-milled competitors, they’re life is a bit shorter. Okay, so it sounds a little like a noise a bullfrog would make. We promise it has nothing to do with amphibians. In fact, “croap” refers to products which are soap-cream hybrids. Because of the manufacturing process used to produce these types, they also carry more moisture, which makes them softer and a bit easier to use. Croap and softer soaps and convenient, as they don’t require a shaving brush to lather. Tallow, which is an animal fat product, is a common, traditional ingredient in shaving soaps. 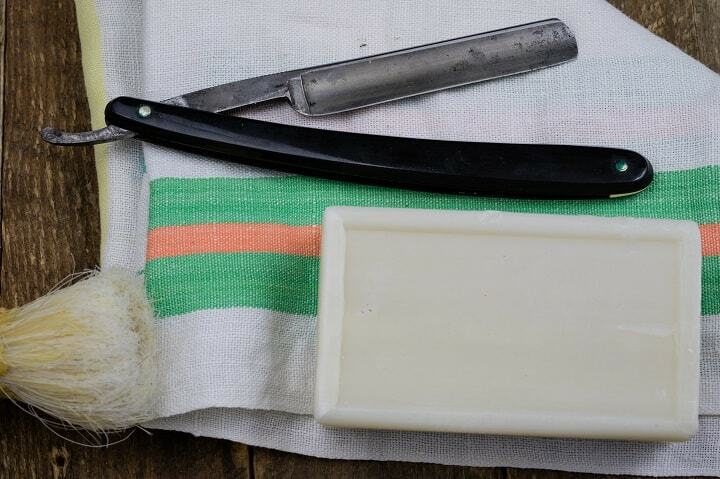 For a traditional barbershop shave, tallow products are the go-to, old-school option. However, if you’re (understandably) a bit put off by the idea of rubbing animal fat on your face, you do have other options. Alternatively, modern products might include an oil (such as olive oil, coconut oil, palm oil or argan oil) as a tallow substitute. These serve the same function as tallow products, but with none of the animal by-products. Outside of animal tallow and vegetable oil products, these days there’s also glycerin-based soaps. These soaps are the new kids on the block and are generally a bit gentler than their tallow and oil competitors. While animal tallow is the classic option, those with sensitive skin should probably stick to glycerin-based shaving soaps. Because they’re a bit gentler, they’re also less likely to irritate skin or cause itching and outbreaks. However, if you’re using a glycerin-based soap and your skin is still dry or irritated, you may want to investigate the other products used in your shaving routine. Try using a gentler aftershave or investing in the best face wash for sensitive skin. Alternatively, if it isn’t your shaving products which are provoking your skin’s sensitivity, it might be the razor itself. If you’re using a multi-blade razor, consider purchasing one of these best razors for sensitive skin or switching to a single-blade safety razor. Because safety razor blades cut facial hair at a less aggressive angle, they’re sometimes more agreeable to delicate skin. When it comes to combating dry skin, the key is in the lather. If a soap’s lather functions properly, it should condition the skin while still retaining its natural oils. Additionally, you’ll want to seek out soaps which contain some kind of organic butter such as shea or mango. What’s most important isn’t the shaving cream or gel, but what happens pre and post shave. If you live in a climate with particularly dry or cold weather, you’ll want to be moisturizing daily regardless. Consider kicking off your shaving routine with a moisturizing face wash and finishing it with a high-quality moisturizer. If shaving soap isn’t up your alley, you do have a couple other options. Though they may not be as luxurious or timeless as a traditional shave with a puck and bowl, they do have their own pros. Here’s how the competition measures up. If a high-quality shaving soap is a gourmet dish of spaghetti bolognaise prepared in Italy, then shaving cream is two-minute noodles. The honest truth is that if you’re hungry, they’re both going to get the job done. That doesn’t mean one isn’t undeniably better than the other. Shaving cream’s major advantage is that it’s so fast and easy to use. Because it usually comes in a quick-applicating container, it foams immediately and is ready for action as soon as it comes out. There’s no preparation, thought or drama. If you don’t have the time for shaving soap, but you love the warmth of a good lather, you can always purchase one of these top lather warmers as a middle-of-the-line compromise. When it comes down to it, shaving gels and shaving creams have pretty much the same ingredients. However, saying that they’re the same thing would be a lot like saying mozzarella cheese and ice cream are the same thing because they both are sourced from dairy. Gel differs from shaving cream mostly in the mere fact that it is gel. Because the consistency is different, it also has differing characteristics and performance. Compared to cream and even soap, gel is much slicker. This makes it better at lubricating, but not without a cost: because gels are thicker, they’re also much more likely to clog your razor and slow the shaving process. So, you’ve sold yourself on purchasing a shaving soap. The next step is to pick a puck that’s going to suit your needs. Because there’s so much variation on the market, this can be a bit of a slippery task. Don’t worry though, we’ve got your back. What draws most men to shaving soap is its texture, so it’s no wonder that the product’s overall feel is a major selling point. When it comes to texture, cushioning and slickness are the two biggest factors. Slickness is what reduces friction when shaving and ultimately prevents irritation or razor burn. The slicker your soak is, the smoother your shave will be. If you’re after a classic close shave, you’ll want a slick soap that allows your razor to glide across your skin without resistance. If the mention of “cushioning” has you thinking of couch cushions, you’re not exactly wrong. Cushioning refers to a soap’s ability to act as a buffer between the razor and the skin. Sure, you want a close shave, but you don’t want the razor blade to actually make contact with your skin and cause damage. Using a soap that has an effective cushion is a good way to help reduce razor burn, nicks and cuts. However, if you do happen to have an “oopsie” and end up with a tiny injury, quickly enlist the help of a styptic pencil or some alum blocks to make sure no infection occurs. Alright, “latherability” may not technically be a word endorsed officially by the Oxford English Dictionary, but you know exactly what it means. If you’re like any other man who watched his father shave and envied his rich, creamy lather, you’re probably after a product that foams up pleasingly but also doesn’t take much to rinse. Ideally, a lather will hit that perfect balance between thick, and light enough to wash. However, if you’ve purchased a product which is supposed to lather well and it refuses to, you might want to check the water in your area. A good shaving soap should leave a clean, pleasant smell behind in its path. Ideally, you want a soap with a fragrance that isn’t overpowering. Commonly, fragranced soaps include citrusy hints or musky, masculine tinges. Regardless, a shaving soap’s smell should be light at best. Ultimately, you should be turning to a good cologne or one of these best aftershaves for your fragrance. An effective shaving soap won’t leave your skin dry, itchy or scaly. In contrast, it’ll leave your chin and cheeks feeling smooth and moisturized. Because the skin on your face is easily dried out, it’s important to use products which seek to hydrate it; your shaving soap should be no different. Again, products which contain shea butter or natural oils are often great at delivering moisture without stripping your skin’s natural balance. A quality, professional-level shave can take as little or as much time as you have. For perfection-seeking shave enthusiasts, the whole process can take an hour or more. Unfortunately, not everyone has that much time to spend on their morning shave. Which soap you select will also be determined, partially, on how much time and effort you’re willing to invest. Harder soaps will take longer to soften for use, while croaps are generally ready more quickly. If you’re pressed for time completely, you might consider skipping a shaving soap altogether in favor of a less-luxurious but more convenient canned cream. Though there’s plenty of variation on the shaving soap market, they all generally have a couple ingredients in common. Most all soaps have the core ingredient of either tallow, oil, or glycerin. Shea butter along with mango butter or other similar ingredients are great natural moisturizers which help ensure that you get a clean, smooth shave every time. They also leave your skin feeling hydrated and renewed. Made naturally from sheep’s wool, in recent years lanolin has become a staple ingredient in many high-quality skin products. It’s a great stand-in for synthetic oil, which sometimes carries harmful toxins. Natural oils such as avocado oil are great natural moisturizers. They also work to combat acne and give your skin an overall even, smooth appearance. You never know what consequences these bad boys come with. While products with synthetic preservatives might be less expensive and a little bit tempting, do your best to look the other way; they’re just not worth the risk. Although the words “mineral oil” probably have positive, healthy connotations in your mind, when mixed into a shave soap it strips away your natural oils. Along with mineral oils, sodium lauryl sulfate is a culprit in the disappearance of the natural oils your body produces to regulate your skin’s hydration and overall health. 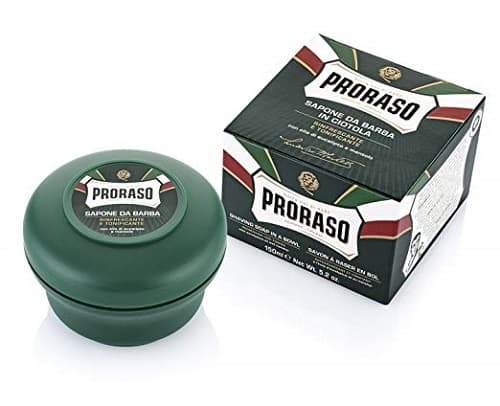 Made with a special, hot soap technique, Proraso Shaving Soap will create a thick lather and soften up your skin and beard for a smooth and close shave without causing nicks and cuts. Once you start shaving with it, you’ll notice the subtle, pleasant smell that’s formed by a combination of menthol, eucalyptus oil and quality soap. The infused eucalyptus oil helps to tone and purify your skin, while menthol is meant to give you a refreshing and cooling sensation. Unlike other shaving soaps in the market, this one is a whipped soap, which means you’ll find it extremely easy to lather. There’s also no need of using a separate mixing cup because you can lather it up in the tub. Less expensive compared to creams and gels, just one tub of this product can last you longer than several cans of shaving gels and creams. 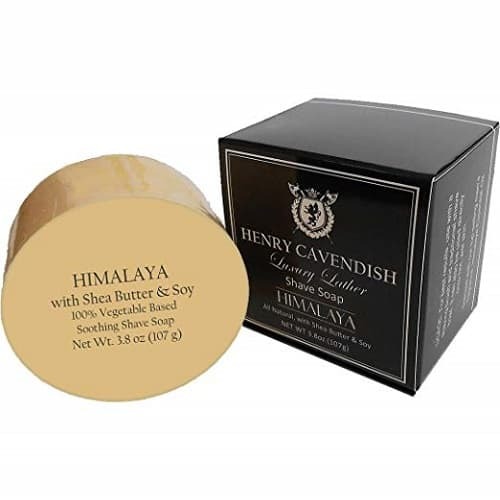 Put together with a special formula that consists of pure natural ingredients, Henry Cavendish Himalaya Shaving Soap is well set to provide you with the best shaving experience. The moment you start shaving with it, you’ll realize just how effective it is in creating a rich lather that lubricates your razor to give a slick and comfortable shave. Unlike other average shaving soaps being sold in the market, this one is long lasting mostly because it’s larger and you can actually use it for about 6 months. Given the skin-friendly natural ingredients composition with no added fragrance, you can confidently use this product without experiencing any skin irritation. Crafted with high-quality, naturally derived, vegan plant ingredients, Men’s Soap Company Shaving Soap will leave your face with a silky, smooth feeling. It has no toxins, dyes, sulfates or parabens and is, therefore, safe for your skin. Preparing your skin and hair for shaving is incredibly fast with this soap. This is because it takes only 15 seconds to form a thick and creamy lather which gives a coating that leads to a smooth shave. With great moisturizing properties and without drying out the skin, this item is infused with glycerin base and shea butter that work to leave your skin feeling soft and silky smooth. After using it for a few times, you’ll notice that it’s very forgiving to the irritable areas of your skin. 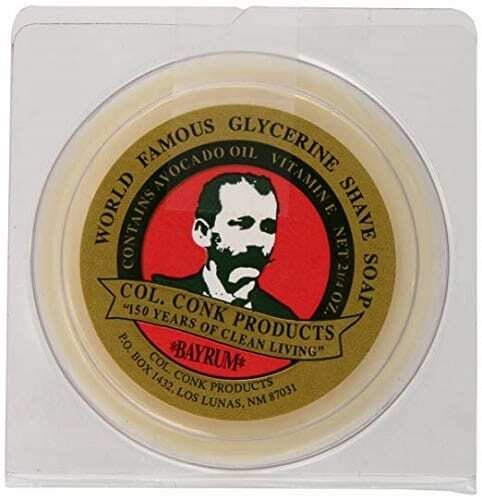 Carefully formulated with avocado and vitamin E, Col. Conk Shaving Soap is kind to your skin and forms a good lather for a smooth and comfortable shave. The soap lathers into a creamy and thick foam with just a little swirling and, after shaving, it will leave your face feeling fresh and clean, not greasy or over-moisturized. You can barely tell that you’ve used it at all even after 10 to 15 times of shaving because it’s durable and can last between 4 to 6 months, if not more. Great scent is another loveable feature of this product. The Bay Rum fragrance does have a manly scent to it, but it’s not overpowering. 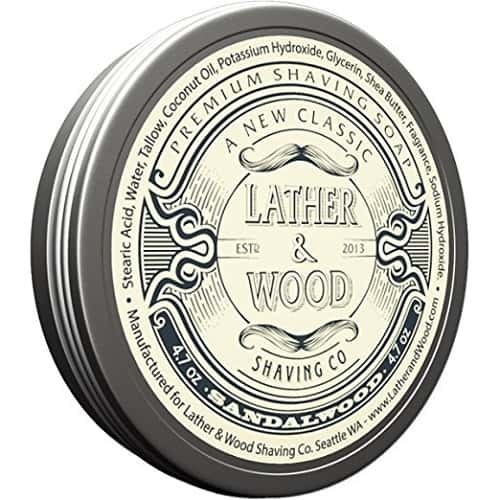 Lather & Wood Shaving Soap is specially formulated to provide you with a daily wet shaving satisfaction without causing nick and cuts. For great results, you can use it with your favorite shaving brush, safety razor, straight or multi-blade razor. 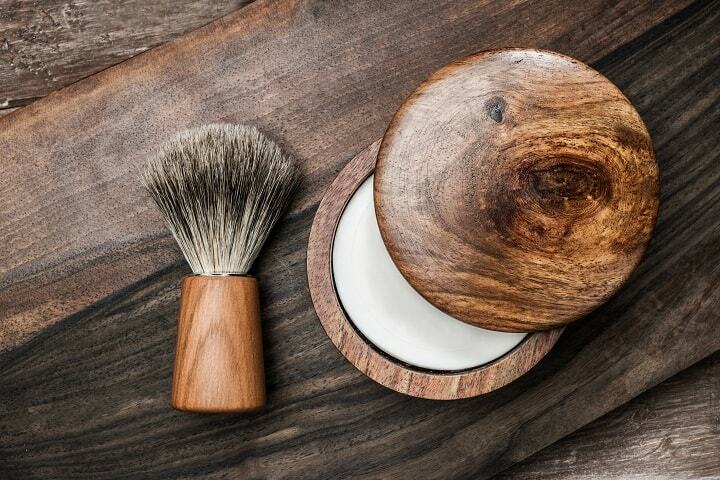 When you start shaving with it, you’ll notice that it forms a lather that doesn’t dissipate even after an hour of staying in your shaving bowl. The lather formed is moisturizing and will offer your skin protection against razor burns and irritation. After using this product for a while, you’ll never touch other products because it leaves your skin feeling refreshed, cool and clean. It’ll also give you an earthy, natural sandalwood scent that’s not overpowering and lasts for a while after shaving. 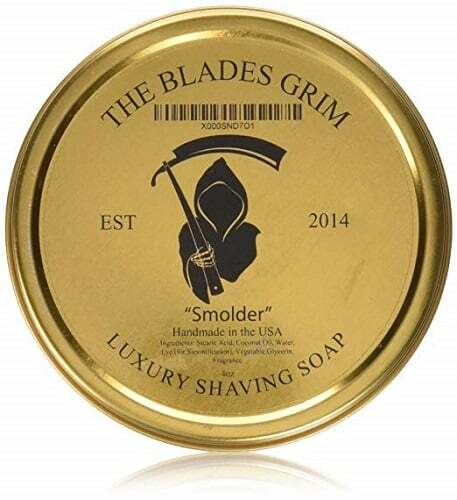 Designed with a formula that’s mostly composed of natural ingredients, The Blades Grim Soap is very gentle on the skin. Formation of a good, thick lather only takes seconds with this shaving soap. The lather offers a perfect glide of the razor for superior skin protection and ultimate shaving experience. After the first shave, you’ll quickly notice the highly praised, mild but pleasant scent that’ll leave you smelling fresh most of the day. For a comfortable, smooth and close shave, all you need is to apply the lather on the area of the skin you want to shave and use your favorite razor to cut the hairs. 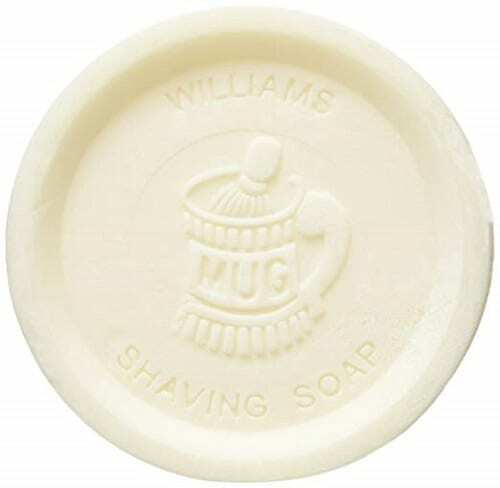 The best thing about Williams Mug Shaving Soap is the fact it’s designed to offer you a long lasting lather and to leave your skin with an all day long soft and smooth feeling. You’ll need to wait just for a few seconds before the lather forms up to provide your favorite razor with a perfect glide for a smooth and close shaving experience. While shaving with this soap, you’ll realize that it prevents razor burns and other skin irritations that are associated with long shavings. Also, it doesn’t dry your face and instead, it gives excellent lubrication and softens whiskers. The scent is also good and will leave you smelling fresh for the rest of the day. 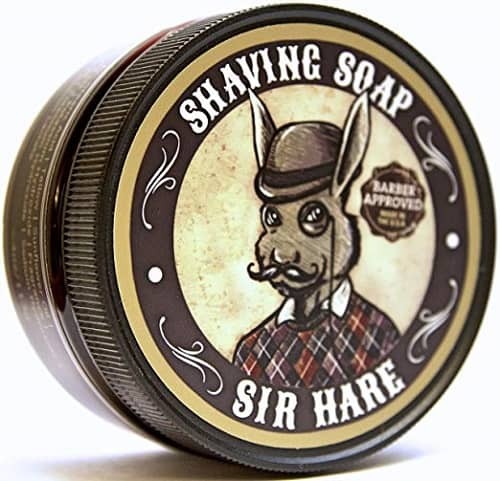 Sir Hare Premium Shaving Soap is designed to form a protective lather and lubricate any type of razor in order to provide you with the closest shave with less irritation. Unlike other standard shaving soaps in the market, the lather formed doesn’t dry out the skin and reduces friction while shaving to prevent rashes and razor bumps. If you have sensitive skin, you’ll find this item to be very forgiving since it’s compatible with all skin types. You’ll also notice that it’s very economical and long-lasting. This is because when you purchase it, you’ll get it in an eight-ounce container and that’s enough to give you more than 100 shaves. 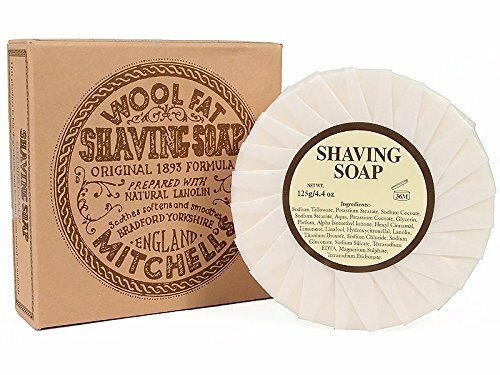 With a special formulation composed of high-quality ingredients including glycerin, Mitchell’s Shave Soap is great for shaving and lathers really well, even in hard water. As you continue shaving with it, you realize that the lather formed can lubricate the blades and allow them to glide smoothly on your face without causing irritation. You’ll also notice that it leaves your face feeling soft and well hydrated with an uplifting, pleasant, light scent. When it comes to usage, simply apply the lather on your face. The lather usually holds onto your face long enough to give you sufficient time to shave with your favorite razor. 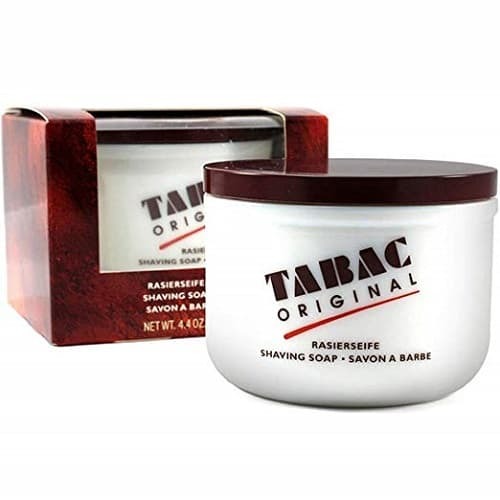 Made with high-quality ingredients, Tabac Original Shaving Soap will produce a thick lather to lubricate the blades and offer good protection and glide for a smooth and close shave. If you like lavender or earthy floral smell, this product is definitely for you. The smell is refreshing and lasts for most of the day. After using it for a while, you’ll notice that it doesn’t cause razor burns, bumps or irritation and is further very kind on your sensitive skin. While shaving, you can easily hold the ceramic bowl in your hand, since it’s of a perfect size and fits perfectly in hand to allow you to load the brush. 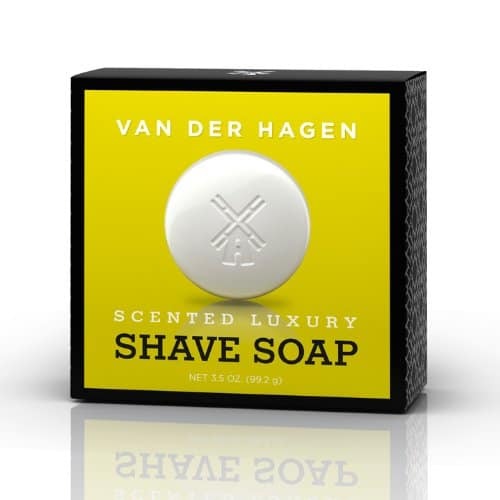 Van Der Hagen Soap is specially made with vegetable-based ingredients and isn’t tested on animals. Once you start shaving with it, you’ll realize that it softens the beard and promotes good razor glide for a comfortable and closer, smooth shave. You’ll love the aftershave experience given by this soap mostly because it leaves the skin feeling soft and smooth with a great smell. Hypoallergenic as it is, this product will allow you to shave confidently without experiencing an allergic reaction and other after shave skin irritations. 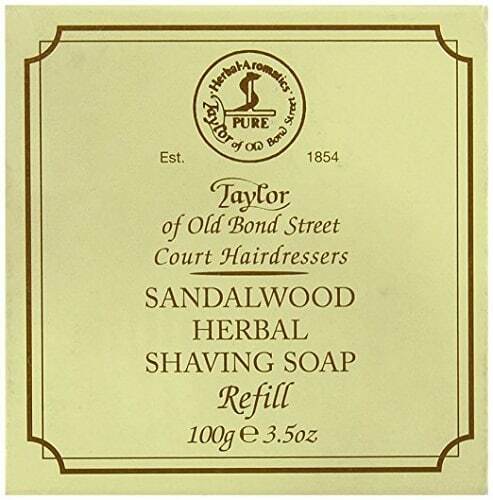 Carefully infused with high-quality ingredients, Taylor of Old Bond Street Shaving Soap is all you need to achieve a close and comfortable shave. The best thing you’ll notice is that it produces a rich, luxurious lather that cushions the blades to guard your skin and provide you with a good shaving experience. Different from most shaving soaps being sold in the market, this product is quick in giving a thick lather that holds onto your face for a little longer to allow you enough shaving time. Apart from a comfortable shave, also expect a pleasant and long-lasting manly smell given by a rich, woody blend of cedar and sandalwood mixed with rosemary and lavender. 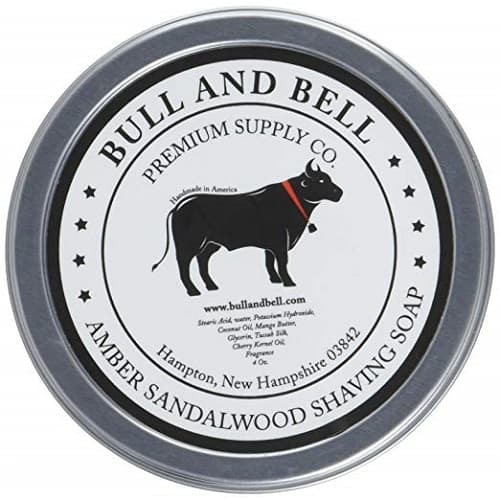 Bull and Bell Shaving Soap is designed to produce a long-lasting, luxurious, rich lather that soothes the skin for a closer shave. The rich lather it creates lubricates the blades and allows them to glide smoothly on your skin. You will experience no irritation while using this shaving soap. The infused moisturizers and mango butter also make it perfect for sensitive skin. You don’t have to worry about the strong or overpowering smell because it has a masculine, light scent of sandalwood and amber that’ll leave you smelling great. 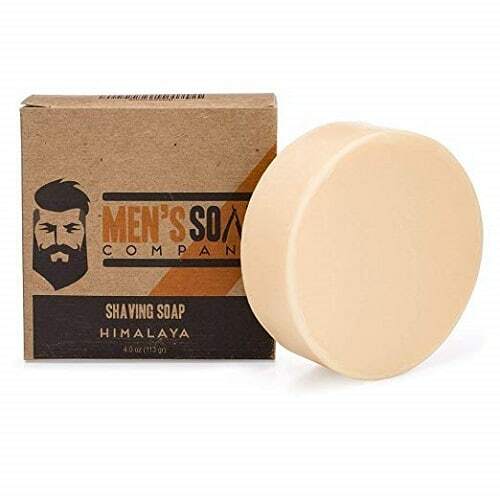 If you have a fast-growing, thick facial hair, this soap is the best choice for you because its creamy lather will enable you to get a clean shave without cuts and nicks. To get a barber-shop, professional cut and feel using shaving soap, you’ll need a shave brush, a shaving bowl, and a little bit of patience. While it is possible to nix the shaving bowl and apply shaving soap onto your face, it’s not nearly as effective. We’re guessing if you’re here it’s because you’re after a classic, quality shave, so we’ll cut right to the chase and give you the step-by-step directions on shaving with a bowl. Before you bust out your razor and get down to business, you’ll need to create an excellent lather. One of the key components of an A-grade shave with soap is the lather’s temperature. Fill your shave bowl with hot water and also splash a bit of hot water onto your soap puck. Then, soak your shaving brush for a couple of minutes. Next, empty the bowl, leaving about a teaspoon of liquid at the bottom. When the soap is softened, you’ll want to lightly whisk your wet brush across the bar’s surface. Ideally, this will cause a thick, creamy lather. The perfect lather will be a velvety, whipped texture rather than thin or bubbly. When your lather has reached the desired thickness and texture, you’re ready to start applying it. Using a circular motion, lightly apply the soap with brisk, continuous brush strokes. Then, use your standard method for a clean, close shave. You’re a classy man and you deserve a shave that matches your caliber. Though canned creams offer immediate convenience, nothing quite has the look, feel and finish of traditional shaving soap. For those who have the desire for a classic, clean shave, shaving soap is the only way to go. If you’ve never tried it, you probably should. Your grandfather would be proud.